High fiber foods can help with most digestive problems, including constipation. Fiber acts as a stool normalizer. It adds bulk and adds water to soften the stool, making it easier to pass through the colon. See your health care provider If you experience constipation. He might suggest adding more fiber rich foods such as rice to your diet to reduce the chance of a recurrence. Constipation means you are having three or fewer bowel movements per week. It occurs when your stool moves through the colon too slowly, allowing it to absorb water from the stool before it leaves the body. This makes your stool dry and hard and difficult to pass. Most people with constipation control their symptoms with diet, stress management and medications prescribed by their physician. The top three recommendations by the National Digestive Diseases Information Clearinghouse are to eat low fat foods with fiber, drink plenty of water each day and exercise regularly to improve circulation. Eating plenty of rice will help you get more fiber into your diet. It is a fibrous grain that can promote bowel regularity and a healthy colon. 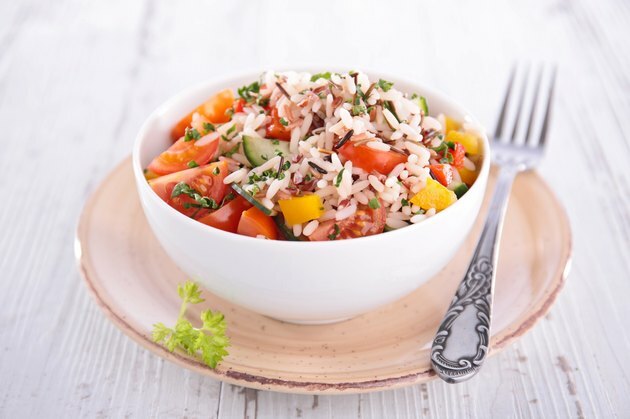 A cup serving of brown or wild rice serves up to a 3.5 g of fiber, which is much more than you can get from white rice, which has 0.6 g of fiber for the same serving. The National Digestive Diseases Information Clearinghouse recommends 20 to 35 g of fiber as a part of a diet that is high in fruits and vegetables and low in saturated fats. Animal based foods such as dairy and meat do not contain fiber. Refined or processed foods, including veggie burgers, white breads and salad dressing, are lower in fiber. Check the ingredients section to be sure of the contents. Adverse effects are rare and usually mild, and may include gastrointestinal upset, nausea, vomiting, abdominal cramping and diarrhea. Observational trials suggest adverse effects occur in only 1 to 3 percent of individuals. Rice may contain bacteria called bacillus cereus. Improper cleaning can lead to a bacterial infection in the mouth.